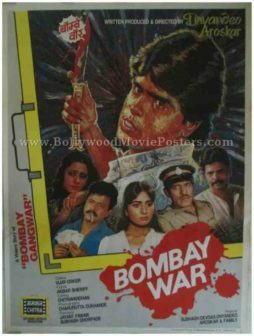 Bollywood poster for sale of the Hindi film Bombay War (1990). This is an actual surviving Bollywood poster of the 1990 Hindi film written, produced and directed by Dnyandeo Aroskar that starred Vinay Apte, Dnyanadeo Aroskar and Ramesh Bhatkar in lead roles. Printed and circulated during the original first release of the film (somewhere in the late 1980s / early 1990s), this Bollywood poster for sale was designed for publicity of the film but never ended up being used. This Bollywood poster was originally designed on a canvas board using a combination of both hand painted artwork as well as still photographic collage. The lead protagonist of the film is seen in a brilliant hand painted portrait prominently in the center of this Bollywood poster wielding the infamous “Rampuri” knife. The knife appears blood stained.